The American P&I Club informs of a change in the Pre-employment Medical Examination (PEME) Program. The change regards the psychology tests, which the American Club will no longer require to ensure compliance with PEME. 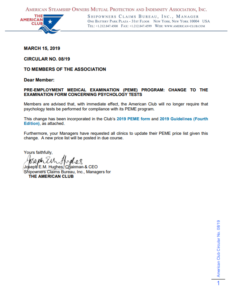 As the American Club informed, effective immediately, it will no longer require that psychology tests be performed for compliance with its PEME program. This change has been incorporated in the Club’s 2019 PEME form and 2019 Guidelines. Moreover, it requested all clinics to update their PEME price list given this change. A new price list will be posted in due course. 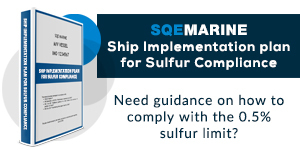 The primary objective of the Club’s PEME program is to protect shipowners from claims regarding medical conditions existing before the employment and to provide crew with a strictly structured health check before going to sea. Operators should also be careful with their manning agents, in order to ensure PEMEs are conducted objectively and without influence from the manning agent, its principle or the seafarer. The examinations are comprehensive from the perspective of the American Club PEME program. However, the Club noted that some tests and procedures may be subject to local or national laws or regulations, such as HIV or psychological testing. 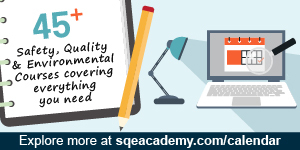 In such cases, operators must make sure that they clearly understand the limitations that this may create to them in the medical examination process.